Don't worry...this isn't dog food. This is people food. I promise. It just looks like puppy chow. I've also seen it called Muddy Buddies, and there are many variations. With St. Patrick's Day coming up, I decided on mint chocolate. Oh my goodness, this stuff is addicting! I must get it out of my kitchen right now. 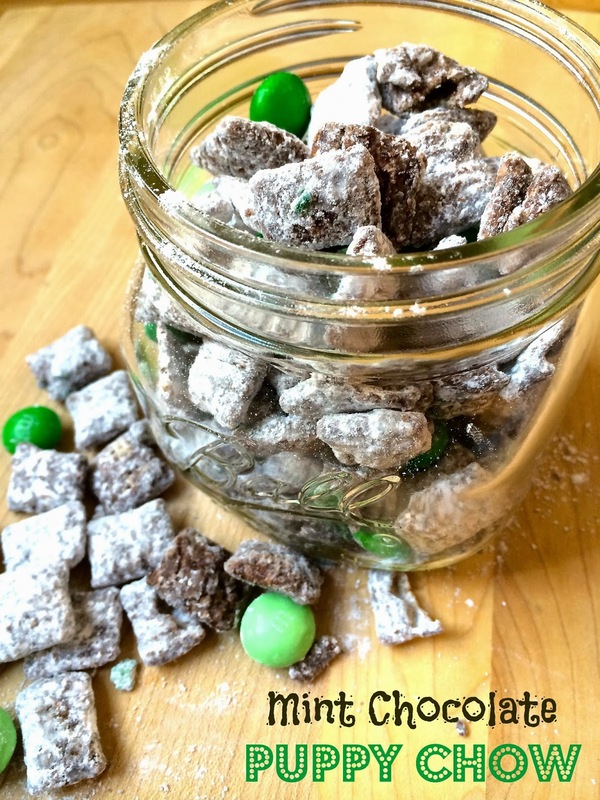 If you aren't familiar with puppy chow, the original recipe is rice chex cereal covered in melted chocolate, peanut butter, and powdered sugar. I used Andes mints in place of the peanut butter in this version, and added shamrock sprinkles and mint dark chocolate M&Ms. I think I have a new favorite dessert. It is incredibly easy to make, takes maybe 15 minutes total, and is gluten-free!! I also think it makes cute little goodie bags for kids. Place 1/2 cup powdered sugar and 1 tbsp. sprinkles (if using) into the bottom of a gallon sized ziploc bag. In a microwave-safe bowl, add the chocolate chips, Andes mints, and butter. Microwave in 30 second intervals, stirring after each interval, until the chocolate has melted. Mix well. Immediately add the chocolate to the cereal. Using a spatula, carefully toss the chocolate and cereal together until evenly coated. Place half of the chocolate coated cereal in the bag with the powdered sugar. Add another 1/2 cup powdered sugar and 1 tbsp. sprinkles (if using) on top. Add the remaining cereal. Top with another 1/2 cup powdered sugar. Seal the bag and gently shake until all of the cereal is coated in powdered sugar. Spread the cereal out in an even layer on a wax paper lined baking sheet. Allow to cool. Toss with the M&Ms.